Are memories stored in just one part of the brain, or are they stored in many different parts of the brain? Karl Lashley began exploring this problem, about 100 years ago, by making lesions in the brains of animals such as rats and monkeys. He was searching for evidence of the engram: the group of neurons that serve as the “physical representation of memory” (Josselyn, 2010). First, Lashley (1950) trained rats to find their way through a maze. Then, he used the tools available at the time—in this case a soldering iron—to create lesions in the rats’ brains, specifically in the cerebral cortex. He did this because he was trying to erase the engram, or the original memory trace that the rats had of the maze. Lashley did not find evidence of the engram, and the rats were still able to find their way through the maze, regardless of the size or location of the lesion. Based on his creation of lesions and the animals’ reaction, he formulated the equipotentiality hypothesis: if part of one area of the brain involved in memory is damaged, another part of the same area can take over that memory function (Lashley, 1950). Although Lashley’s early work did not confirm the existence of the engram, modern psychologists are making progress locating it. Eric Kandel, for example, spent decades working on the synapse, the basic structure of the brain, and its role in controlling the flow of information through neural circuits needed to store memories (Mayford, Siegelbaum, & Kandel, 2012). Many scientists believe that the entire brain is involved with memory. However, since Lashley’s research, other scientists have been able to look more closely at the brain and memory. They have argued that memory is located in specific parts of the brain, and specific neurons can be recognized for their involvement in forming memories. 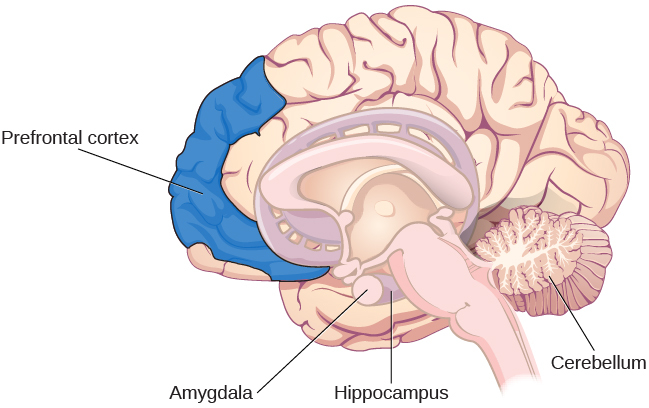 The main parts of the brain involved with memory are the amygdala, the hippocampus, the cerebellum, and the prefrontal cortex (see Figure 9). Figure 9. The amygdala is involved in fear and fear memories. The hippocampus is associated with declarative and episodic memory as well as recognition memory. The cerebellum plays a role in processing procedural memories, such as how to play the piano. The prefrontal cortex appears to be involved in remembering semantic tasks. First, let’s look at the role of the amygdala in memory formation. The main job of the amygdala is to regulate emotions, such as fear and aggression (see Figure 9). The amygdala plays a part in how memories are stored because storage is influenced by stress hormones. For example, one researcher experimented with rats and the fear response (Josselyn, 2010). Using Pavlovian conditioning, a neutral tone was paired with a foot shock to the rats. This produced a fear memory in the rats. After being conditioned, each time they heard the tone, they would freeze (a defense response in rats), indicating a memory for the impending shock. Then the researchers induced cell death in neurons in the lateral amygdala, which is the specific area of the brain responsible for fear memories. They found the fear memory faded (became extinct). Because of its role in processing emotional information, the amygdala is also involved in memory consolidation: the process of transferring new learning into long-term memory. The amygdala seems to facilitate encoding memories at a deeper level when the event is emotionally arousing. In this TED Talk called “A Mouse. A Laser Beam. A Manipulated Memory,” Steve Ramirez and Xu Liu from MIT talk about using laser beams to manipulate fear memory in rats. Find out why their work caused a media frenzy once it was published in Science. Another group of researchers also experimented with rats to learn how the hippocampus functions in memory processing (see Figure 9). They created lesions in the hippocampi of the rats, and found that the rats demonstrated memory impairment on various tasks, such as object recognition and maze running. They concluded that the hippocampus is involved in memory, specifically normal recognition memory as well as spatial memory (when the memory tasks are like recall tests) (Clark, Zola, & Squire, 2000). Another job of the hippocampus is to project information to cortical regions that give memories meaning and connect them with other connected memories. It also plays a part in memory consolidation: the process of transferring new learning into long-term memory. Injury to this area leaves us unable to process new declarative memories. One famous patient, known for years only as H. M., had both his left and right temporal lobes (hippocampi) removed in an attempt to help control the seizures he had been suffering from for years (Corkin, Amaral, González, Johnson, & Hyman, 1997). As a result, his declarative memory was significantly affected, and he could not form new semantic knowledge. He lost the ability to form new memories, yet he could still remember information and events that had occurred prior to the surgery. Although the hippocampus seems to be more of a processing area for explicit memories, you could still lose it and be able to create implicit memories (procedural memory, motor learning, and classical conditioning), thanks to your cerebellum (see Figure 9). For example, one classical conditioning experiment is to accustom subjects to blink when they are given a puff of air. When researchers damaged the cerebellums of rabbits, they discovered that the rabbits were not able to learn the conditioned eye-blink response (Steinmetz, 1999; Green & Woodruff-Pak, 2000). Other researchers have used brain scans, including positron emission tomography (PET) scans, to learn how people process and retain information. From these studies, it seems the prefrontal cortex is involved. In one study, participants had to complete two different tasks: either looking for the letter a in words (considered a perceptual task) or categorizing a noun as either living or non-living (considered a semantic task) (Kapur et al., 1994). Participants were then asked which words they had previously seen. Recall was much better for the semantic task than for the perceptual task. According to PET scans, there was much more activation in the left inferior prefrontal cortex in the semantic task. In another study, encoding was associated with left frontal activity, while retrieval of information was associated with the right frontal region (Craik et al., 1999). There also appear to be specific neurotransmitters involved with the process of memory, such as epinephrine, dopamine, serotonin, glutamate, and acetylcholine (Myhrer, 2003). There continues to be discussion and debate among researchers as to which neurotransmitter plays which specific role (Blockland, 1996). Although we don’t yet know which role each neurotransmitter plays in memory, we do know that communication among neurons via neurotransmitters is critical for developing new memories. Repeated activity by neurons leads to increased neurotransmitters in the synapses and more efficient and more synaptic connections. This is how memory consolidation occurs. It is also believed that strong emotions trigger the formation of strong memories, and weaker emotional experiences form weaker memories; this is called arousal theory (Christianson, 1992). For example, strong emotional experiences can trigger the release of neurotransmitters, as well as hormones, which strengthen memory; therefore, our memory for an emotional event is usually better than our memory for a non-emotional event. When humans and animals are stressed, the brain secretes more of the neurotransmitter glutamate, which helps them remember the stressful event (McGaugh, 2003). This is clearly evidenced by what is known as the flashbulb memory phenomenon. A flashbulb memory is an exceptionally clear recollection of an important event (see Figure 10). Where were you when you first heard about the 9/11 terrorist attacks? Most likely you can remember where you were and what you were doing. 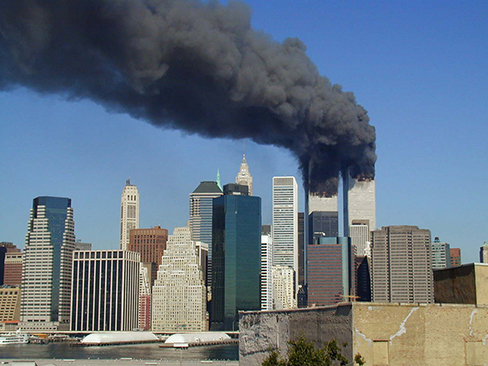 In fact, a Pew Research Center (2011) survey found that for those Americans who were age 8 or older at the time of the event, 97% can recall the moment they learned of this event, even a decade after it happened. Contrary to what President Bush recalled, no one saw the first plane hit, except people on the ground near the twin towers. The first plane was not videotaped because it was a normal Tuesday morning in New York City, until the first plane hit. Some people attributed Bush’s wrong recall of the event to conspiracy theories. However, there is a much more benign explanation: human memory, even flashbulb memories, can be frail. In fact, memory can be so frail that we can convince a person an event happened to them, even when it did not. In studies, research participants will recall hearing a word, even though they never heard the word. For example, participants were given a list of 15 sleep-related words, but the word “sleep” was not on the list. Participants recalled hearing the word “sleep” even though they did not actually hear it (Roediger & McDermott, 2000). The researchers who discovered this named the theory after themselves and a fellow researcher, calling it the Deese-Roediger-McDermott paradigm. Parts of the Brain Involved with Memory by Rajiv Jhangiani, Ph.D. is licensed under a Creative Commons Attribution 4.0 International License, except where otherwise noted.